Happy Tuesday! It’s Biggest Loser night so that always makes me look forward to getting my day over with and sitting down to enjoy the show Today is going to be a super busy day so I am sure time will fly by. 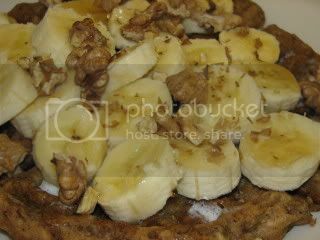 This morning I decided it was time to pull out one of the Vegan/Gluten Free Banana Nut Waffles that I froze a little while back. These taste just as good reheated in the toaster as they did the day I made them. Yum! 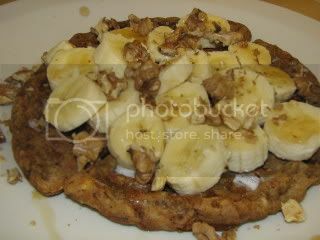 I think I have determined I LOVE anything banana nut. I enjoyed this with some watered down Pete’s coffee and of course some water from my SIGG. Make sure you let me know your opinion on The 30 Day Transformation and if you want to give it a go beginning tomorrow, April 1st by leaving a comment on that post. I will be sharing my All Clad Stir Fry Pan review with today’s lunch post. It was awesome to use it to make up my lunch last night. Sarah W ~ you are too cute. I think you will post that every time I eat them. They are so amazing though – I absolutely agree.